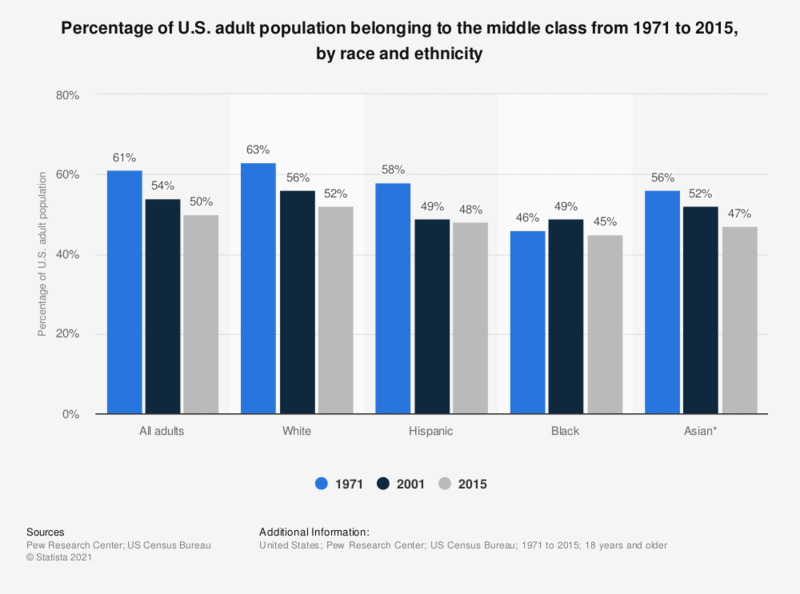 This statistic shows the percentage of the U.S. adult population that belonged to the middle class from 1971 to 2015, by race and ethnicity. In 2015, about 50 percent of U.S. adult residents were part of the middle class. In that year 56 percent of those who some hadcollege belonged to the middle class, compared to only 37 percent of those who did not graduate from high school. This study defined middle class income households as those with an income between 67 and 200 percent of the U.S. median household income, after adjustment for household size. Middle class income ranges from about 42,000 U.S. dollars to about 126,000 U.S. dollars per year for a three person household. * No data available on Asian Americans for 1971, the presented data is from 1991.